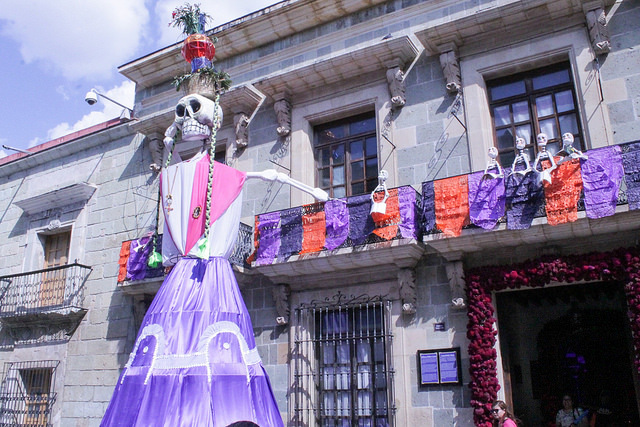 From exhibit of ofrenda traditions in different villages in Oaxaca, Mexico at the Central Public Library in Oaxaca, Mexico, 2017. The shift from October to November is celebrated all over the world in different ways. 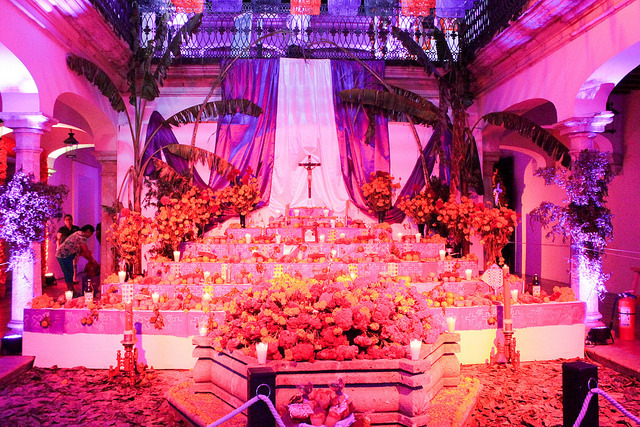 One of our favorite celebrations this season is Día de los Muertos, celebrated traditionally in Central and Southern Mexico, where families create altars, or ofrendas, to welcome the spirits of their family members who have passed. Each village uses their own particular decorations and motifs. 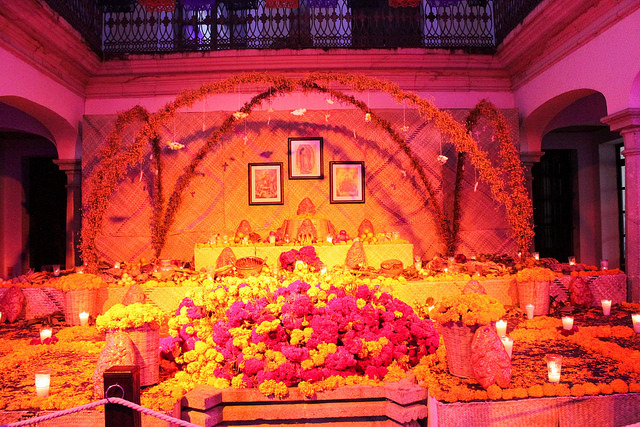 You may see calaveras, or sugar skulls, among many other items, on ofrendas as an offering for the souls that have passed. Making and decorating skulls is one of our favorite seasonal crafts because it helps us share a Mexican tradition (Stephanie, our founder is Mexican-American) and is fun for all ages and skill levels. Last weekend Stephanie hosted a craft station at the Garment District Maker’s Way and I hosted a gathering at Geeky Teas in Burbank. Everyone created a unique sugar skull and we talked about other cultural traditions from around the world, including how different cultures remember and celebrate those who have passed. Calavera Decorating Station at the Garment District’s Makers Way in Manhattan, NYC. In Burbank, Geeky Teas hosted our workshop, where Donna the proprietor exercised her creative background with an intricate violet, yellow and green design taken from traditional motifs. Geeky Teas has smart, loyal, interesting, and fun patrons who love board games, tea, and, on Sundays, Doctor Who. We had so much fun being creative with their crowd, who showed some serious prowess with their cake decorating and art skills. Decorating calaveras at Geeky Teas in Burbank, California. Sugar skull designs are famous for their colorful intricacy, featuring swirls and flowers, and patches of shining foil. To decorate a sugar skull, it’s really only necessary to have a piping bag of royal icing and your own creativity. Some people design theirs with traditional motifs, and others personify their skulls. Each one ends up beautiful and unique. Sugar skulls are made out of sugar, meringue powder (egg whites), and water, and turn into concrete as they dry. They are decorated with royal icing, a powdered sugar, meringue powder, and water mixture that also dries hard as a rock. Traditionally, sugar skulls are brought to the cemetery after Dia de los Muertos celebrations, but they will keep for up to a year. Check out our Instagram story ‘Craft Kitchen’ @distillcreative to see how we made our calaveras. One of the people we met at the Geeky Teas workshop in Burbank managed to keep his sugar skull for 10 years! What do you do to celebrate this season? 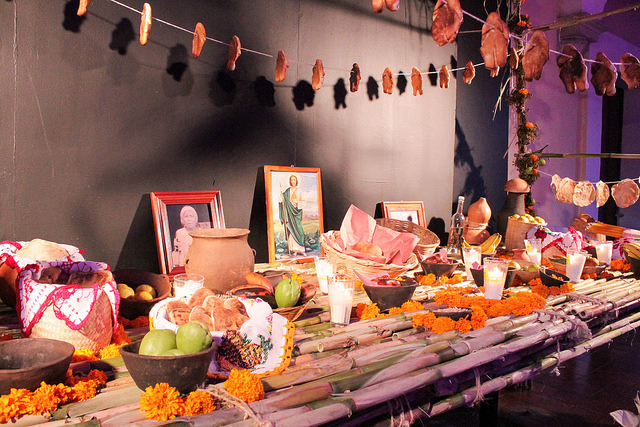 Have you ever made an ofrenda?